The Royal Knights of the Burnished Spur are a joint Crown Knightly Order and Regiment dedicated to defence of the Kingdom of Galenthia, originally founded as an order of House Tarris before passing over the the Galenthian Realm after the end of the Second Succession War. They are based at the fortress and village of Spur's Rest within the Duchy of Tarris, who aid in provisioning and supporting the Spurs in a joint venture with the Crown. The knightly order has a great interest in the art of cartography and the knowledge of the lay of the land, instilling such knowledge in their squires from the very moment they join, believing that such knowledge gives them a crucial edge in their martial dealings. Though quite capable in melee combat and known for their preference of bladed weapons, they are also known for their love of ranged weapons and most lately their love of the hand cannon. Training in such weapons begins in earnest for the squires who wield bows and indeed for the knights who are afforded the honour of wielding a hand cannon. 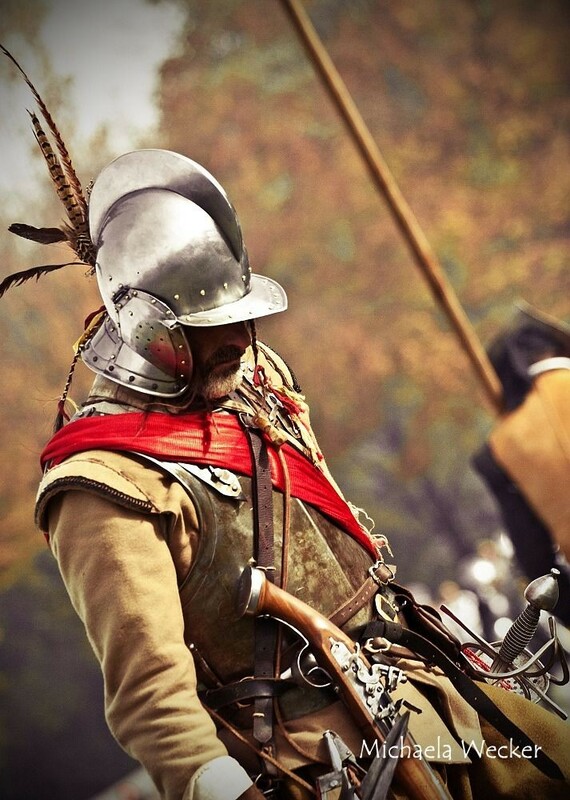 Their regiment is composed of a mix of pike and shot and acquitted itself extremely well during the Second Succession War, participating in many battles against the rebel Thorn forces and winning numerous battle honours. 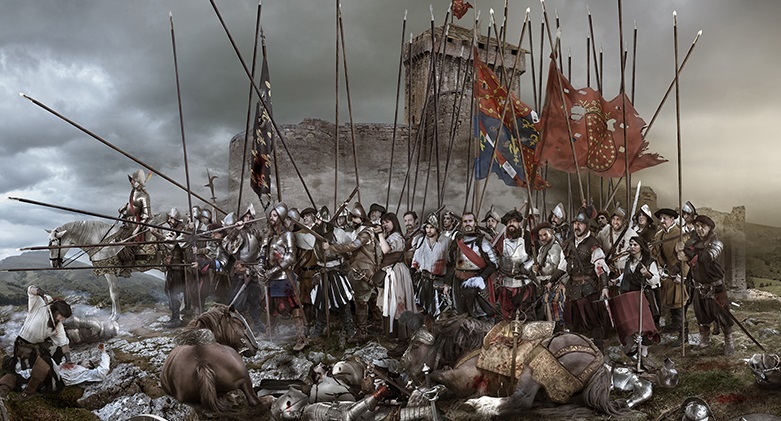 The order was founded in the year 1800 by Sir Aelfric Gisbon, a knight who knew that to know the lay of the land was to ensure a great tactical advantage and so their motto 'To know the land is to know victory' came to be. An able cartographer and soldier, Sir Aelfric Gisbon recruited squires and knights and at their height, the order held ten knights and ten squires. Though with many a skirmish and many a battle, the numbers dwindled over the years. Sir Aelfric passed away and thus yielded the Order to Sir Wulfred de Ufford in the year 1855, his former squire. The heraldry of the Knights of the Burnished Spur is a golden cockerel against a plain white background. Quite why was lost with the death of Sir Aelfric Gisbon, though there are a few tales and rumours. With the raising to the nobility of now Lord Wulfred de Ufford, command of the now Spurs passed to Sir Jauffre D'Ascoyne, a long serving knight and formerly second in command to (then) Sir Wulfred. However, Lord Wulfred felt the longing for his old regiment and resumed command after the start of the War of the West. In 1868, Queen Melisande of Galenthia granted the order and regiment the title "Royal", securing their place in the service of their realm. Feel free to apply to become A squire or a knight, join us in our service to Galenthia and our devotion to black powder. 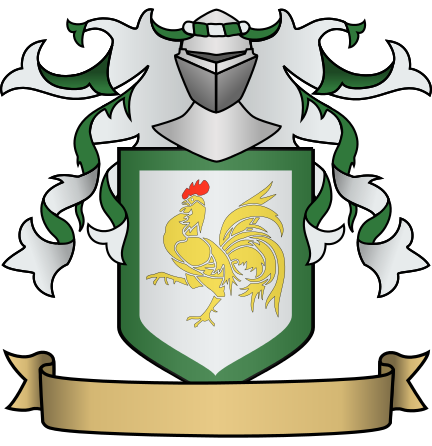 The Royal Knights of the Burnished Spur have served the noble House of Tarris since they were formed a good sixty or so years ago, and now serve the Kingdom of Galenthia directly. Swift atop their steeds, the order was something of a scouting force during wars and skirmishes gone by. Known for their love of hand cannons, this group of knights are noisy, brash and stoic in battle. Since the raising of their pike and shot regiment in the Second Succession War, they've become a balanced, feared and respected force. The Royal Knights of the Burnished Spur consist of two separate parts: The Order proper, made up of 50 knights and 25 squires, and the Royal Regiment of the Burnished Spurs, made up of 150 long cannoneers and 200 pikemen organised into four separate companies. Despite the separation, the Order and Regiment nearly always work together. 1800 IE 14th Janvier - Sir Aelfric Gisbon, a hedge knight of little repute from about the region of Griffon Pointe raises the Order of the Burnished Spur and sets about recruiting. 1802 IE 17th Marse - The Order numbers ten knights and nine squires and their allegiance is pledged to the noble House of Tarris. Sir Aelfric's skill as a cartographer ensures a certain skill as a scout and skirmisher for the noble house. They are known for their squires being well trained archers, while the knights defend them as they attack the enemy. 1818 IE Janvier - The Thirty Year War begins and the Order is diminished by losses in battle. Both squires and knights are amongst the casualties and by the end of the war, the Order is at an all time low. 1837 IE Janvier - Sir Aelfric Gisbon recruits his first squire from a small village. War ensures the training is swift and failure not an option. Through the intervening years the Order harasses the enemy and continues to fight and bolster efforts where needed. Losses continue to mount faster than new blood can be brought into the order. Though several squires are granted a knighthood at times throughout the war, a good portion die in battle. 1851 IE Fevrier 5th - The few remaining knights and squires of the order (three knights and two squires) hear of the peace and celebrate the end of the war and toast the fallen. 1851 IE Marse - The order seeks to rebuild and return to the small hall that was their home away from home. Sir Aelfric Gisbon, now aged and with a body scarred by battle settles falls ill as his body fails him. Recruitment of squires and knights begins in earnest once more. 1855 IE Juillet 24th - Sir Aelfric Gisbon passes away in his sleep, his former squire Sir Wulfred de Ufford takes command of the Order. A knight like all those who serve within the order who has long been devoted to House Tarris. 1860 IE Septembre 15th - The Knights hear of the Battle of the Betrayer that occurred ten days previous. 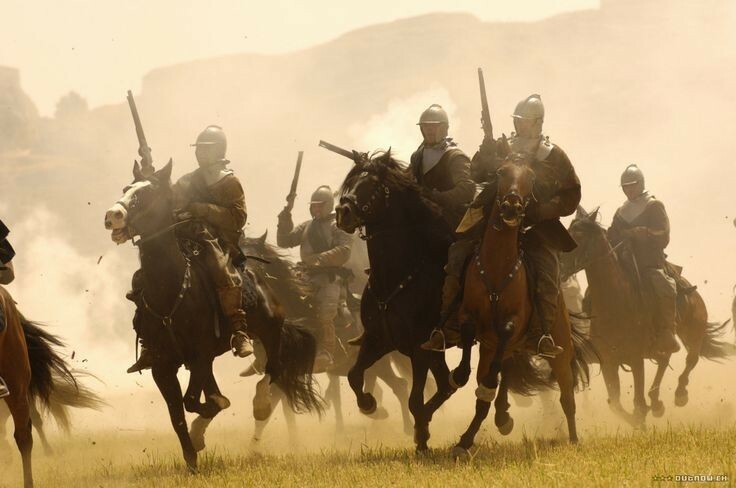 They end their patrol and skirmishing against the former enemy and ride out to inform the Duke of their continued allegiance to House Tarris. 1860 IE Septembre to 1863 Fevrier - The Order skirmishes with and tracks some of the soldiers still loyal to the Thorn. Without mercy and with such swiftness, they ride down all those who oppose their Queen. The nature of the hunt leads to Sir Wulfred being given the byname 'The Wolf' for his leading of the 'pack' and the death they brought with them. Several small skirmishes ensue through the two and half years at which the Thorn loyalists remain at large. 1865 IE Janvier - Sir Wulfred de Ufford's Order finds itself in love with black powder and the explosive weapons it allows. Squires remain as ever archers, while the knights become masters of the hand cannon. 1865 IE August - Sir Wulfred de Ufford's love affair with the hand cannon is given new purpose when he is commissioned to raise a regiment on behalf of His Grace, Duke Gauvain Tarris. 1865 IE Septembre The Regiment tentatively named Gauvain's Irregulars is slowly raised. Numbers grow as recruits are gathered and welcomed from the surrounding countryside over the following months and their training with pike and long cannon begins in earnest. 1866 IE Fevrier - Sir Wulfred de Ufford alongside Sir Graham Eberlin and most of the Burnished Spurs hold a barricade on a road leading to Goldhollow. His force of twenty five squires (archers) and thirty knights (hand cannon) delay a force of over one thousand two hundred Thorn soldiers with three volleys of shot and arrow and a hastily pitted road that threw the Thorn's first advance of Pike into confusion. Despite losses as the first Thorn volley splintered their cover, they gave a good account of themselves and bloodied the road and delayed the siege long enough for messengers to ride and the alarm to be sounded. Nine knights and nine squires were lost on the road, shot by the massed ranks of enemy long cannoneers. 1866 IE Marse - At a village to the north, the Regiment and the surviving members of the Order set up their headquarters and build defences. The Order fills its compliment of squires from the village, thus linking it to the village in blood alongside good honest toil. At the rout of Tamlin Ford, Sir Wulfred is grievously injured as he attempts to keep the retreat of the Tarris forces steady. Though he falls in battle, his fellow knights manage to drag him to safety and the retreat becomes a rout. At the Battle of Circester, Sir Wulfred leads a contingent of Valley troops in charging a battery of the enemy artillery. They scatter the enemy and proceed to capture a good portion of their artillery without a shot fired from a single piece. The long cannon of the Burnished Spur proceed to shatter the massed charge of several hundred Caltu who break against the shot and pike of the regiment, turning superior numbers into an utter rout of the enemy. 1866 IE Avril - Sir Wulfred leads a charge against enemy soldiers who had hoped to ambush them a distance from the capital of the Valley of Scales. With Sir Wulfred at the fore, the Burnished Spur who number but fifty massacre the seventy five enemy soldiers with no loss of life or injury to themselves. They proceed onwards to finish their successful scouting mission. 1866 IE Mai - Sir Wulfred leads a charge against enemy artillery that is soon found to be false. The entire charge ends up within a trap, stakes are raised to destroy the charge and the forest about them set aflame. Ordering a retreat, Sir Wulfred manages to ensure that the bulk of his battered troops escape through the burning forest and out of the trap laid for them. It was upon returning to the main body of loyalist troops that Sir Wulfred and his men found that the enemy was not too far behind and battle was soon thrust upon them. The knights of the Burnished Spur fought as heavy infantry given their mounts were too tired to act as cavalry after the escape, while Sir Wulfred commanded the long cannoneers of the regiment. Under Sir Wulfred's command a blistering volley of shot was poured into the enemy, even while under fierce artillery bombardment. The loyalist forces prove victorious. 1866 IE Summer - Sir Wulfred is ennobled and relinquishes command to Sir Jauffre D'Ascoyne, his second. The regiment passes from the service of House Tarris to the Kingdom of Galenthia itself, intended by Duke Gauvain Tarris of forming the nucleus of a royal force. They move their barracks to the fortress and village of Spur's Rest, located in the Tarris Duchy, which they had taken possession of the previous winter. 1867 IE Autumn - The Spurs are granted the "Royal" title in recognition of their service and new status as a force at the disposal of the Kingdom itself. 1868 IE Winter, Spring - The Spurs are deployed to Aequor under the command of Baron Thomas Chandus in order to support the legitimate Aequorian government against rebels. They engage and defeat both forces of Kentaire's 2nd Volmar Legion as well as House d'Kemp's banner before moving back to Galenthia. 1868 IE Summer, Autumn - The Spurs are reunited with their old commander Lord Wulfred in Goldhollow and perform brilliantly in the defence of the city, acting primarily as the fixing force for much of the battle. In the final battle, many of the Spurs sacrifice themselves in a disparate holding action that captivates Galenthia for their gallantry. They earn many accolades for this battle. 1873 IE Winter At the battle of Mathis against Cardinal Teleko's Rikton forces, the Spurs hold the centre and pour withering fire into the enemy. The explosion from Teleko's sorcerous duplicity wounds and kills many, while a good many more retreat from the crater, while their Lord-Commander aided by other survivors, engage with Teleko in vicious combat. Lord Wulfred de Ufford is grievously wounded, but survives. 1874 IE Summer Lord Wulfred dies peacefully beneath an apple tree while commanding the surveying of Galenthia territory prior to the apparent Partharian invasion. The Order has long had a reputation for drinking and feasting, though a reputation for fighting too. Most of the drinking and feasting comes from their toasting of fallen comrades. Quite why this knightly order came to love the hand cannon is anyone's guess, though it was perhaps a logical step from training their squires in archery. The Knights will often be found swiftly moving about the field of battle as light cavalry, or deploying their ranged expertise, the explosive percussion of their hand cannon and long cannon marking them out amidst the enemy. Like any hedge knight, there is a certain romantic ideal when it comes to their status. The common born man or woman raised to such status. The knights of the Burnished Spur are benevolent and well thought of about the Tarris Duchy, aiding those who require it and renowned for their loyalty to Galenthia. They are certainly friends to any innkeeper given their love of ale and their almost pathological desire to toast their fallen comrades in every inn they visit. The last leader of the Order died from a surfeit of drink. Sir Wulfred was chosen as the next leader in a drinking competition that he won with ease. The Order of the Burnished Spur is like most other Orders, the Knights of the Order take on a squire and in due course that squire may well prove himself or herself in battle or during a tournament and be raised to knighthood. Other Hedge Knights may join should they desire to serve also. There is however one difference in that this Order provides the basis of a Regiment of Long Cannons and Pikemen. And as such commoners are also required to fill the ranks. With the formation of the Regiment alongside that of the Order of the Burnished Spur, the introduction of ranks has provided the Order with the following. Knights and squires fall under the command of Sir Jauffre and Sir Daffyd, while the regiment is also structured as to fall under the command of Sir Jauffre. The captains report to Sir Jauffre directly, or Sir Daffyd in the event of Sir Jauffre being incapacitated. Captain of Pike (A veteran soldier who leads the Pikemen of the regiment, ensuring all orders are passed down through the regiment). Captain of Musket (Another veteran soldier who leads the musketeers, ensuring all orders are passed down through the regiment). The full company numbers 150 Musketeers, 200 Pikemen, 50 Knights & 25 Squires. For the purposes of RP, there are indeed a few knights who have names and are free to be apped if they strike anyones fancy. Sir Aelfric Gisbon (Deceased) - The founder of the order who lived a life of hedonistic excess in his youth and relished a good fight. Sir Jauffre D'Ascoyne - One of the older knights who has served the Order and the Tarris family for nearly twenty years. Quiet and reserved, he is steady and capable in battle. Currently the Knight-Commander of the Order and Regiment. Sir Havelock Napier - Has held the post of Quartermaster for nigh on twenty years, having served for longer than Sir Jauffre. Grizzled and blessed with an eye for detail. Stoic Knights - They aren't exactly the most glamorous of Knightly Orders, but they know their business and they know that to wage war is to suffer hardship. They suffer these hardships without complaint. Gruff, weathered and often veterans, they endure and suffer with earthy humour and scant emotion. High Alcohol Tolerance - If there's three things the Order's founder was famed for, it was his ability to drink and wench and fight. Out of those three it was his drinking that he particularly enjoyed. The Order fights hard and when duties permit it drinks just as hard. The yearly banquet that the knights and squires attend is a most raucous affair and their deeds are spoken, stories told and battles revisited as they drink and drink and drink. The squires often falter, but the knights are all of hardy stock and can often be said to drink many a man or woman beneath the table. Black Powder in their Blood - They started with a fascination in archery, ranged weapons offering a tactical advantage in some skirmishes to a love of the new hand and long cannons. The knights are all trained in their use, while the squires long for such a day as they continue to use their bows. But the hand cannon is something which the Knights are well known for, the roar of a fusilade of shot, the reek of the powder and the flash of the explosion ensuring these loud knights are seen and heard on the field of battle. They love the explosive nature of the powder and the destruction it wreaks upon their enemies. Perceptive - The Knights of the Burnished Spur have always stood by their motto 'To know the Land is to know Victory' and so they ensure a certain understanding of the lay of the land is passed down to their Squires. From knowledge of map reading and geography to seeking an advantageous location to make a military stand. The Knights have a keen eye for such detail. Born in the Saddle - Having served House Tarris for as long as they have almost been formed, they have come to have a certain knack for horsemanship. Blessed with their links to House Tarris' strong equestrian links and heritage, plus their somewhat unique roles (when mounted atop a steed) over the years as scouts, skirmishers and harrassers of the enemy, their feet are sure in the stirrup. Veteran Fighter - This order has skirmished, battled and fought since its creation and left its dead and spilled its blood across many a battlefield. They are hardened warriors who have been tempered in battle. Gifted to the Knightly Order of the Burnished Spur by Sir Wulfred de Ufford are a lightsilver blade and an ornate long cannon, each item gifted to Sir Wulfred for his service by His Grace, Duke Gauvain Tarris on the 17th of Mai, in the Year of the One 1866. And so as the years do pass and Knight-Commanders come and Knight-Commanders go, each weapon is also to be passed from Knight-Commander to Knight-Commander. Such is the will of the benefactor Sir Wulfred de Ufford. Proudly stitched upon the green battle standard of the Royal Knights of the Burnished Spur, a great golden spurred and crested cockerel is surrounded by gold ribbons bearing the names of the following places, Second Succession War, Goldhollow 1866, Tamlin Ford 1866, Circester 1866, Valley of Scales 1866, Strand 1866, d'Kemp 1867 and Goldhollow 1868, though the scroll of Goldhollow, 1868 is adorned with a double gold band marking their triumphant and sacrifical last stand at that particular battle, following after is the battle honour for Mathis, 1873. Goldhollow, 1868, with double gold band for their sacrifice at the final stand. The regimental motto is, "Knoweth the Land, Knoweth Victory". The Spurs were certainly not uniform in their manner of dress for battle, with brigadine and scale, and a mish mash of anything inbetween adorning the knights and squires of the Order. The only certainty was the colour of the sash worn by its commanders, and even then they were often in a state of disrepair given their hard riding and hard living selves. With the honour of becoming a Royal Regiment, the Spurs adopted a simple uniform that would mark them well. A buff coat, over which a breastplate is worn, with breeches, riding boots, and a roundhead helmet that may well be decorated depending upon rank and honours received. Officers (as shown above) wear a bright red sash that marks them out with a certain distinction.